I hate to admit, but I don’t really like things that come from cans. 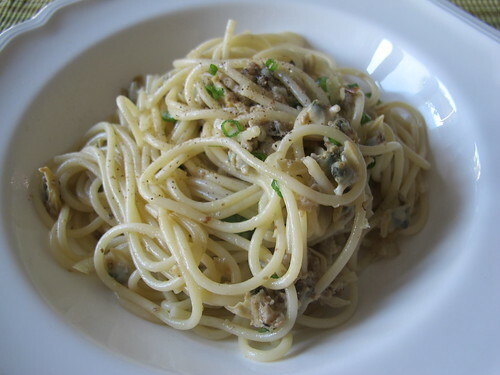 But this blog post is all about clams from cans and dried pasta. Everyone might not have canned clams, but the majority will have some sort of pasta in the cupboard, right? If not, this recipe does not need more than five ingredients. There are no exact measurements, as everyone prefers more of this and less of that. Quick note: when this was made, the tomato was left out. I find the tomato adds more sauce to the pasta, as if it’s just the pasta with clams..it is very dry. Cook the pasta in boiling water. Open the can clams and rinse throughly. There can be bits of clam shells that are bound to be unseen. In a pot, large enough for all the ingredients, heat oil. Throw in the onions or garlic and stir them until light brown. Toss the tomatoes and clams until heated through. Lastly add the drained pasta to the tomato-clam sauce. Turn off the heat and stir in garnish. This recipe is good for days when you don’t want to think of what to have for dinner after a long day of work or lazy Saturdays.